The compact ScopeMeter 120 Series is the rugged solution for industrial troubleshooting and installation applications. 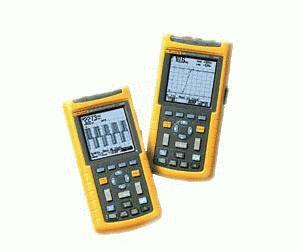 It is a truly integrated test tool, with oscilloscope, multimeter and paperless recorder in one affordable, easy-to-use instrument. Find fast answers to problems in machinery, instrumentation, control and power systems. In the complex systems of today, a meter measurement just does not give enough detail to determine the cause of a fault. Signal anomalies, dropouts and glitches that might cause a machine to go down, are best displayed with an oscilloscope. The ScopeMeter 124 and 123 meet the needÜfor simultaneously measuring and checking waveforms. The unique Connect-and-View triggering automatically displays stable waveforms of virtually any signal. It really is as easy as one-two-three!